......that's because it's a Blues harp! Just search for "mediumWalter" to see what's on offer . Adam has posted more than 190 instructional and entertaining videos on YouTube where you can pick up some really great tips as well as seeing a really fine selection of snazzy shirts. While you're at it, check out the instructional material including harp tab available on his website. 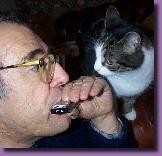 Welcome to my blues harp instructional page. This is not a pure instructional page but more a series of pointers from someone who has been playing blues harp for more than 40 years. When I first started to learn to play, the amount of instructional material was limited to a single tutor and source material was very hard to come by. Now with free tuition on YouTube from a number of top players as well as stand-out performances from all the blues harp greats, it is possible to make significant progress in a relatively short time. 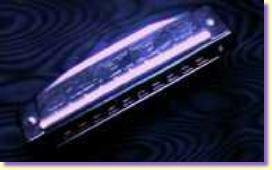 This page will point you towards all the most useful links and recorded material as well as giving useful guidance on some key aspects of playing blues harp. If you are new to blues, your first stop should be my Blues Who's Who page which includes a comprehensive guide to Harp players on record. In 1960, I was in the record department of the Army and Navy Stores in Victoria Street in London looking at a Sonny Boy Williamson LP and I got talking to the person next to me about the difficulty of capturing the sound. "It's quite easy really" he said and, to my surprise he took a harp from his pocket and showed me how to bend a note. I also had a harp in my pocket and I was delighted to find that he had given me that magic bit of instruction that I had so sorely needed. To this day I don't know who he was but I never looked back. In the early '60s I used to appear regularly on Ready Steady Go as a Manfred Mann look-alike (a long story) and I took every opportunity I could to get advice from harp players appearing on the show. I got my first tip on playing the harp from Van Morrison, then the singer with "Them", and he told me to listen to Little Walter. Jack Bruce, later of Cream, told me that Forest City Joe was "the guvnor". I also picked up tips from Keith Relf of the Yardbirds. (I recently saw the film "Quadrophenia" and got the shock of my life seeing myself jigging about in front of the Who all those years ago in the scene where the "hero" is watching Ready Steady Go. My ears had taken about a week to recover from being so close to the speakers. Follow this link and there it is on YouTube and there I am, 10 seconds into the clip.